Paddlefest 2018, truly was one for the books. Water travelers lunched, in the wee small hours, to a glorious sunrise. 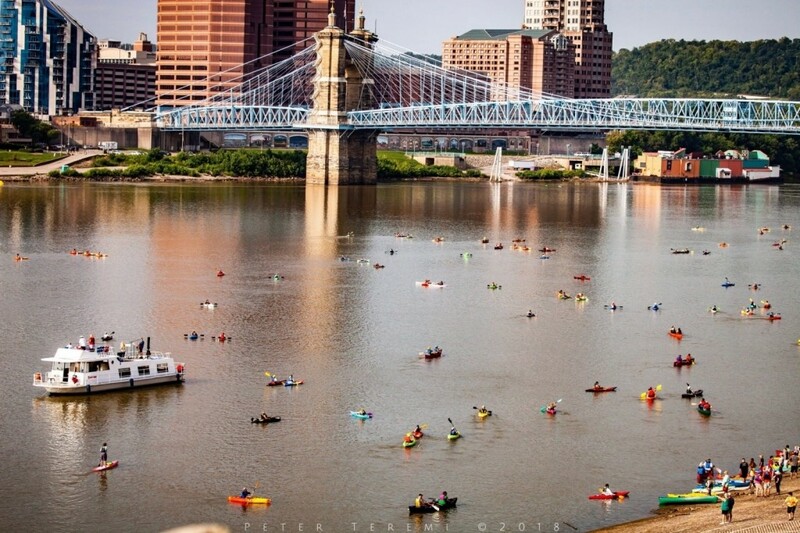 The air was warm and clear as boys and girls of all ages, took to the Ohio River in search of adventure. Murphy and I opted to remain landlubbers today, along with my Photographer friend Aly, canvassing the riverfront looking for unique ways to tell this story through the lens. Murphy’s keen eye spotted more than a few canine participants, as well as several pigeons and a river otter. I suspect the otter did not fill out the proper registration forms, but we will let him slide. If you did not get a chance to participate, or at least spectate, here are a few Murphy-Cam moments from the event. We hope you enjoy these. Feel free to comment, and thanks for spending some time with us. Happy Murphy-Cam! Thanks SO much Peter for these outstanding pics. I will share on our Paddlefest Facebook page. Looking forward to working more closely with you on next year's event! My pleasure Brewster. What a fantastic event! Well organized, and enjoyed by all, as far as I could tell.